This synergy of purpose between owner and designer has resulted in a yacht that doesn’t simply maximise exterior spaces — it uses them as a starting point for the entire design. 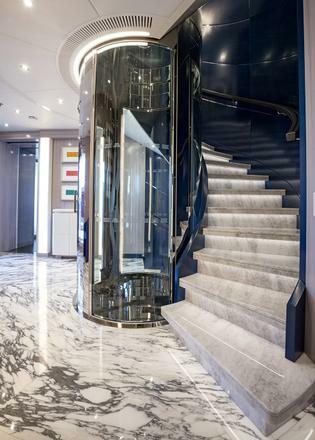 The project was sparked five years ago when Benetti asked a selection of top designers to pen concepts for the Italian yard, presented with fanfare at the 2012 Monaco Yacht Show. These became a book — a fantastical brochure for Benetti clients — and when Cohen leafed through its pages, Cor D Rover’s pool-centric drawing stood out. The proportions of the pool itself also necessitated that lengthening. “We started with a six by three metre pool, but the owner wanted it bigger,” says Rover. 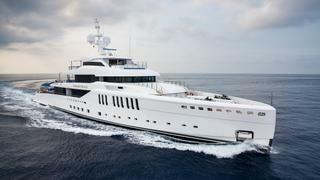 At 10 by 3.6 metres, with a depth of 1.2 metres at its deepest point, the result feels exceptionally large. Consider this: Oceanco’s 2007 Alfa Nero is 15 metres longer, but that yacht’s famous pool (the first of its kind) is only 1.6 metres longer than Seasense’s, and is almost the same width. 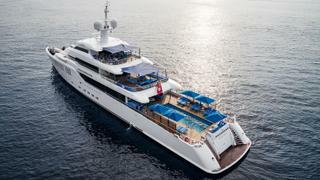 Supporting 27,000 litres of water was another task facing Benetti. While project engineer Marco Coiatelli plays down the difficulty — “we are not building rockets” — the scale of this feature did require beefing up its surrounds. And it does tricks too. The water drains into a dump tank below to avoid wasting fresh water overboard, but it can also stay in the pool during navigation without sloshing about or causing stability problems. “We decided to ask MARIN [Maritime Research Institute Netherlands] to tank test the boat, to understand the behaviour of the pool with different headings, wave periods and sea states,” says Coiatelli. The results showed no problems in reasonable sea states, with due consideration from the captain. Their technical work reduced the free surface of water — so it can’t build up momentum to create a big wave that will spill over the edge. When it’s empty, the crew can transform the pool into a basketball court using 22 panels stored in lower deck lockers, in an operation that Rover estimates will take half a day (they haven’t tried it yet). A basketball hoop affixes to the deck overhang at the forward end of the pool. “Benetti thought that might be an interesting idea and my three sons love basketball, so I thought why not?” says Cohen. When the pool is in use, this is still one spectacular playground. Teak decking runs athwartships rather than fore to aft, emphasising the breadth of the space — and giving a luxurious feeling of sprawl. The fact that you can walk all around the water does the same job — it is a lavish use of space — and also visually underlines an intellectual point, that this pool lies at the centre of the design. Teak louvres along the sides of the aft deck can be adjusted to shade lounging guests from sunshine pouring on to the pool, as do broad pagoda-like umbrellas by Yachting Line, while misters keep things cool. Forward of the pool is a teak-decked dining area with a table that stretches athwartships (again, emphasising the beam) and forward again a television lounge. Two sets of massive sliding doors can divide the pool/dining area/lounge into two or three spaces, or, when left open, create one sprawling indoor-outdoor space that runs for about half the length of Seasense — more than 30 metres. 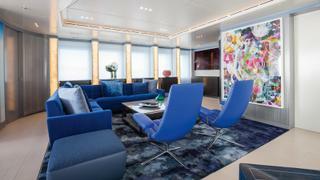 “There are a lot of blues on there and they might look alike, but they’re different,” says Walt Thomas, joint principal of AREA, the LA-based architecture and design firm that penned the yacht’s decorative theme — its first yacht project aside from one of Cohen’s Rivas. The sort of interior design schemes commonly seen on the dock in Monaco were out of the question — as Thomas puts it, what they had seen was either “boring or over the top, like way over the top”. The owner wanted something that was different, “but at the same time would still feel comfortable, contemporary and timeless,” he adds. But that was not the only principle in play. “We’ve done a couple of residences and a lot of office projects with Mr Cohen. I think his mantra for every project is that he doesn’t want to ever see something repeated. Every room has to be different — you can’t repeat any finishes and you can’t repeat colours or fabrics. Everything has to be unique,” says Thomas. 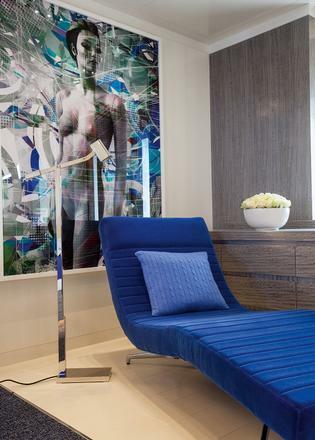 The resulting décor is, as Thomas accurately describes, like a jewellery box: lapis lazuli velvet and leather furniture by Holly Hunt and Chai Ming Studios among others, with silky, mottled blue carpets by Tai Ping in the television lounge, as well as in the upper saloon, where the palette is spiked with the pinks, golds, limes and emeralds of the owner’s artworks. 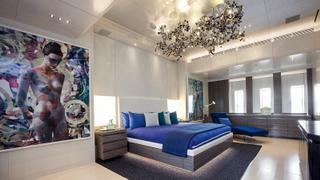 It’s a colour scheme that could be overpowering in smaller spaces, but the scale of this boat can take it. 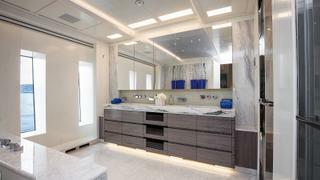 The owner’s suite, situated forward on the main deck, is huge and glamorous, from the monolithic marble bath in the en suite to dressing rooms and a long grey wood desk. The design also makes the most of the recessed ceiling over the bed, with a mirror-polished stainless steel chandelier by Studio Roso that glints in the light. Aft of the suite is a VIP perfectly positioned for family members, while what is quite correctly labelled on the GA as the “grand entrance” sits aft of here. Down via a marble staircase, or the lift that centres it, lie four guest cabins with the same breathtaking height. Crew accommodation and the galley on the lower deck, as well as the main deck pantry and upper deck captain’s cabin, benefit from this vertical freedom too. The engine room and technical spaces, meanwhile, have such spacious surrounds that some bits of kit look like exhibits in a modern art gallery. 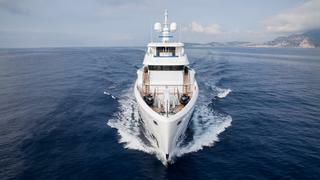 The effect of vertical space on the profile — making it taller — is offset by the sheer length of Seasense, as well as the tapering of that aft deck, the size of which reduces the overall volume of superstructure. The plumb bow and purposeful exterior style also lend themselves well to high ceilings. “We were looking for almost a friendly version of a navy or a frigate style of boat, very white, giving the appearance of masculinity and safety,” says Rover. But this was not the only knock-on effect. The special height of the owner’s cabin meant “we had to sacrifice the seating arrangement in front of the wheelhouse”, Rover says. 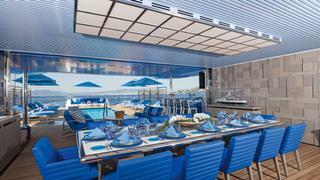 But the pool area has rejigged the way that one would expect all the exterior decks to be used. The superyacht sundeck is now a private spot for family breakfasts, sweating it out in the gym or soaking in the superyacht spa pool up front. 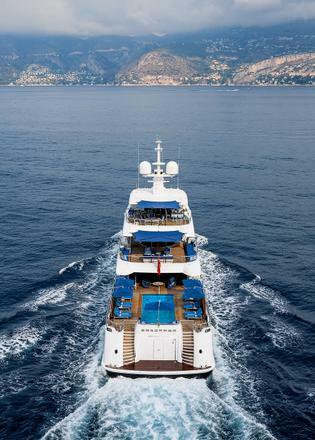 And while the main deck is traditional for formal dining, on Seasense the upper deck is in play: a custom circular table by AREA straddles the line between the upper saloon and its aft deck, combining a blue Sodalite stone top and a Blue Eucalyptus Frise veneer. Curved sliding doors enclose or open up this dining area as desired. With this owner, it seems likely those doors won’t be closed very often. And why should they be? 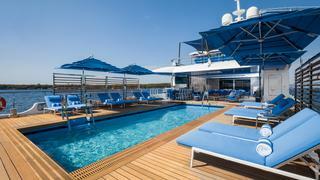 It’s a lifestyle at sea that makes perfect sense.